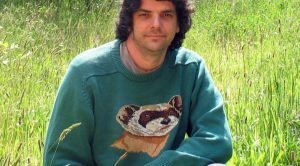 “Today, as the world is being murdered, what are you doing to defend the Earth?” That is a question from a recent video by our feature guest this week: deep green thinker Derrick Jensen. He is the author of 25 books, including “A Language Older Than Words“; his 2007 book “As the World Burns: 50 Simple Things You Can Do to Stay in Denial”; plus others like “Resistance Against Empire”; and “Earth at Risk: Building a Resistance Movement to Save the Planet.” Derrick Jensen also writes magazine articles and appears in videos, including a great series on You tube. We played a sample from one of Derrick’s You tube videos on the Radio Ecoshock show a couple of weeks ago. According to Wikipedia, Derrick earned a Bachelor of Science degree in mineral engineering physics at the Colorado School of Mines. Then he got a Masters of Fine Arts in creative writing from Eastern Washington University. That was a big life switch. On Radio Ecoshock, I interview a lot of top scientists, from dozens of specialties that examine nature. In the past, Derrick had an uneasy relationship with science, even though he was trained in it. We talk about that. Derrick recently started what I hope will be a series of You tube videos called “Without A Net”. He draws unknown prompts from a cookie jar, like an improv for philosophy and social critique. I ask a couple of quick questions for Radio Ecoshock “without a net”. Derrick Jensen, why are some people mad at you? Check that out in the interview. One I didn’t ask Derrick, but should have: Is there a doorway out of the trap set by our own creations? I’ve tuned into Jensen’s work since 2006. He spoke out early on violence and abuse of women. And in his videos, Jensen says he was abused as a child. Yearning for an end to the abuse against nature, Derrick says industrial civilization must fall. Maybe most things will be swept away as we move closer to our beast origins. Would that be a good thing? I was wondering how the best of work like Jensen’s can continue through what James Howard Kunstler called “The Long Emergency”. Maybe some principles could be preserved in rituals? WILL THE BILLIONAIRES SAVE US? Democracies are floundering around the world. Is a run toward authoritarianism is just a last stage in the necessary collapse of industrial civilization? There is another day-dream out there and it goes like this: the world’s richest people will realize the planet is in trouble and organize among themselves to save us. Will the billionaires save us? Apparently they prefer to make sure the system that enriches them (while impoverishing others and the Earth) keeps running as long as possible, running to what Jensen calls “The End Game”. Russia has a new death missile and America has another record military budget and the Trump kill-the-climate plan. It looks like the majority of humans accept of mass suicide. In fact, we work very hard to make it happen. Maybe we know, and we are trying to take ourselves off the planet, to save what’s left of living things. What do you think? Our first Radio Ecoshock interview with Jensen was posted October 15, 2007. I raised the case where a student asking John Kerry questions was tasered and removed, without any dissent from the rest of the youth there. Derrick said “The vast majority of people will never resist” and referred us to the book “Modernity and the Holocaust” by Zygmunt Bauman. This year we’ve seen large protests across America by women and by students. Should that give us more hope about the resistance? I call my program Radio Ecoshock partly because as we rocket into a weird world without nature, I think all of us are in a state of shock. It is like the medical state shock after a threatening experience. Maybe that is partly why we do not resist the destruction of our own biosphere. The Greatest Show on Earth is now carried on cable TV, and in newspapers like the New York Times and the Washington Post. Who can compete with the spectacle of the Donald Trump unreality show. It is hard to look away. Is the American government actually collapsing, and can the economy be far behind? The climate is crashing, and a lot of folks are trying to cope with the latest “weather” disaster. But that is not the main story in the media. If we are getting sucked into the denouement of the Donald Trump show, or whatever the political theater is in your country, is that another kind of climate denial? Here are some of my questions for Derrick, and for you. Do you think bioregionalism, or even feudalism, is the next stage? What do you think of ecosocialism? Do you think humans will go extinct within your lifetime, and if so, why do we bother to talk about the things we talk about? What is “Deep Green Resistance” and what is your role there? In a recent video titled “Undercutting Assumptions” Derrick calls out the cultural bedrock idea of land “ownership”. That concept, that we “own” nature, to do anything we want, is completely out of tune with reality. Listening to Derrick’s redefinition, or reconception, of “ownership” of land – maybe he is creating parts for a life view that will be needed after the current system crashes. Is his work really waiting for an audience in the future? In a recent video, Jensen “pushed away the pain to finish the game” – until he couldn’t. I think Derrick Jensen’s long battle with Crohn’s Disease may have helped him develop his rich inner life, beyond what others experience. After this discussion, I will make another Radio Ecoshock show next week. Most of us will go back to work and keep on consuming things. We will never choose to go hungry, to become homeless, or to die. Something has to stop the madness of mega-destruction, but what? It is eerie when a description of a past age seems to explain what we will be facing as the climate shifts this century. Around 4,270 years ago, the grasslands of Egypt disappeared, leaving a vast desert. Archaeologists claim to have discovered a regional climate shift during a time of written records and great buildings like they pyramids. I’m Alex Smith. Join me again as we wrestle with the dragon, on Radio Ecoshock. ← Beware Marine Heat Waves! Having man-haters who advocate violence on your show really shows how desperate and ideologically driven you are while pretending to advocate science. IT’S NOT SCIENCE I DON’T TRUST, IT’S SCIENTISTS. IT’S NOT REVOLUTIONS I DON’T TRUST, IT’S REVOLUTIONARIES.